Skateboard ramps come in many shapes and sizes. 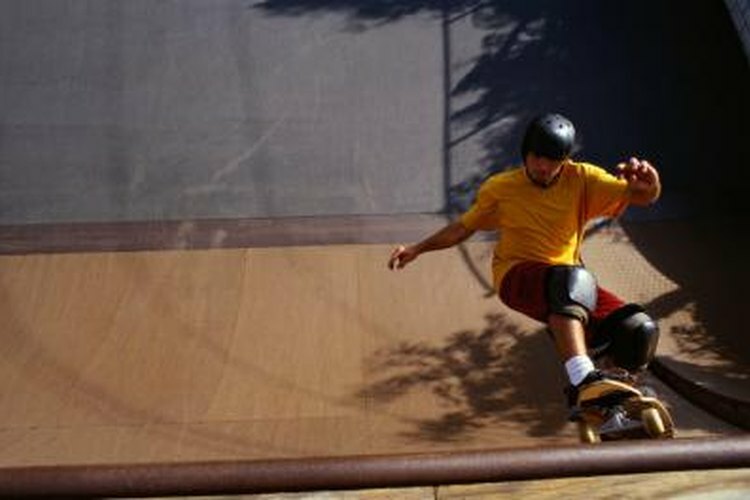 A skateboard ramp made of high-quality material will resist weather issues such as rain. Outdoor ramps are designed to be durable and withstand abuse. However, taking additional steps to waterproof your ramp helps protect it, keep it in good shape and extend its lifetime. A well maintained ramp will last seven years or more, so make weather proofing a part of your basic maintenance routine. The standard way to waterproof your ramp is to paint it using a paint designed specifically for use on skate ramps. Coating your deck with paint protects it from various weather conditions such as heat, humidity and sunlight, as well as rain. It's best to paint the wooden frames before you put the ramp together and then paint the exterior. If your ramp is already together then at the very least paint the exterior. You'll need to touch up the paint every three years. Another way to protect your ramp from rain is to use a thick tarp to cover the surface of the ramp. For the best protection, use a tarp in addition to painting your ramp. The ramp needs room to breathe, otherwise moisture and humidity get trapped underneath the tarp. To give the ramp space to breathe, rest the tarp on a few two-by-fours that you get from your local home improvement store. A heavy duty tarp large enough to cover your ramp will cost about $100.